Posted in: Public Outreach. Tagged: dust devils, Stargazing. 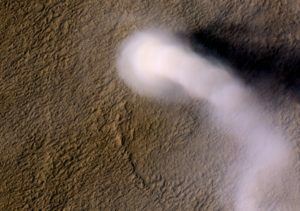 Dust devils occur ubiquitously on Mars, where they have been observed from space and from landed spacecraft. Martian dust devils may present a hazard to exploration of the planet, but they have also lengthened the lifetime of the Mars rovers. Join the Physics Department on Friday, Sep 1 at 7:30p in the Multi-Purpose Classroom Building, room 101 to hear about research on terrestrial analog dust devils conducted by Boise State’s own Prof. Brian Jackson. He will discuss a recent pilot study using an instrumented quadcopter to sample active dust devils and will present encounter footage collected onboard the drone. After the presentation at 8:30p, we will stargaze on the roof of the Brady Street Parking Garage. The entire event is free and open to the public. Contact Prof. Brian Jackson (bjackson@boisestate.edu – astrojack.com – @decaelus) with any questions. Posted in: Meetings. Tagged: exoclipse.